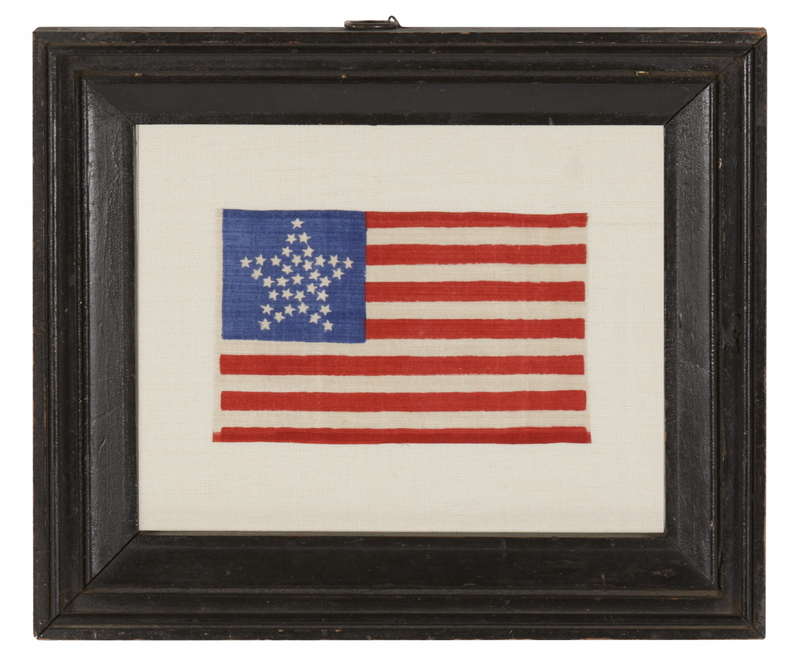 Frame Size (H x L): 10.75" x 12.75"
Flag Size (H x L): 4.25" x 6.5"
34 star parade flag, printed on silk. The stars are configured in a variation of what is known as the “Great Star” pattern [one large star made out of smaller stars]. Great Stars take on many forms. This particular one is comprised of a star-shaped perimeter, surrounding a wreath of 8 stars, with a single star in the very center. 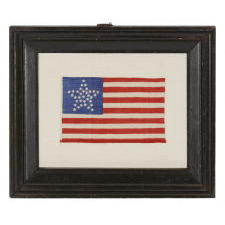 This variety is interesting, not only because of the inner wreath, but because when star-shaped or circular designs appear in printed flags, they are almost always accompanied by additional stars outside the principle pattern. Sometimes simplicity is better. There is something to be said about the strong graphics of the one big star against the rich, royal blue ground, unencumbered by smaller stars around it. Because there was no official configuration until 1912, the design was left to the liberties of the maker. 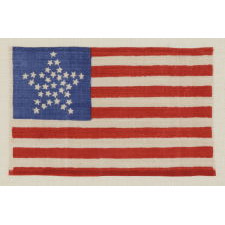 Among flag collectors, the Great Star configuration is perhaps the most coveted geometric pattern. 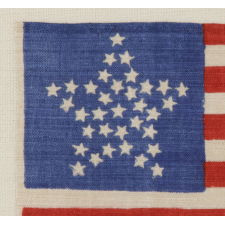 It seems to have came about shortly before 1818, when Congressman Peter Wendover of New York requested that Captain Samuel Reid, a War of 1812 Naval hero, help to create a new design that would become the third official format of the Stars & Stripes. The primary concern of ship captains was that the signal be easily recognized on the open seas. Reid’s concept of placing all the stars in a star-shaped pattern would have kept the constellation in roughly the same format as the number of states grew and more stars were added. Such a distinct design could be quickly identified at a distance. 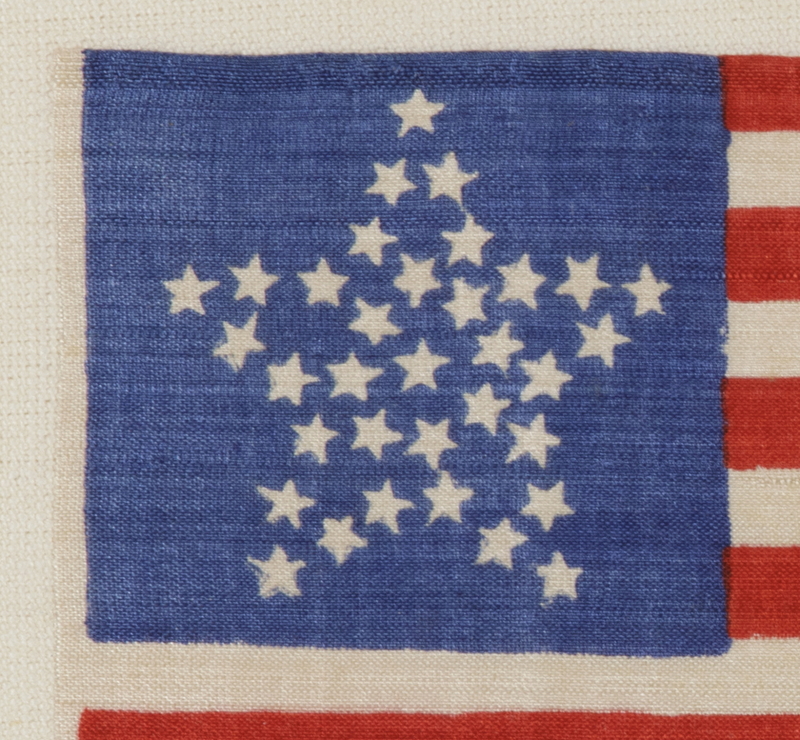 Though his proposal was rejected by President Monroe due to the increased cost of arranging the stars in this manner, the Great Star was produced by anyone willing to make it. 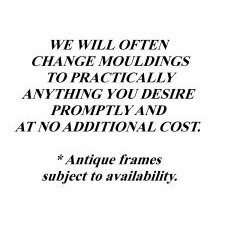 Its rarity today, along with its beauty, has driven its desirability among collectors. 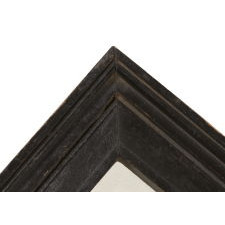 This is an extremely rare example and even more extraordinary due to its remarkable color and state of preservation. Kansas was admitted into the Union as the 34th state on January 29th, 1861, about 2 ½ months before the Confederate assault on Fort Sumter that marked the beginning of the Civil War. The 34th star was officially added on July 4th of that year, but most flag makers would have added a 34th star with the addition of Kansas in January. 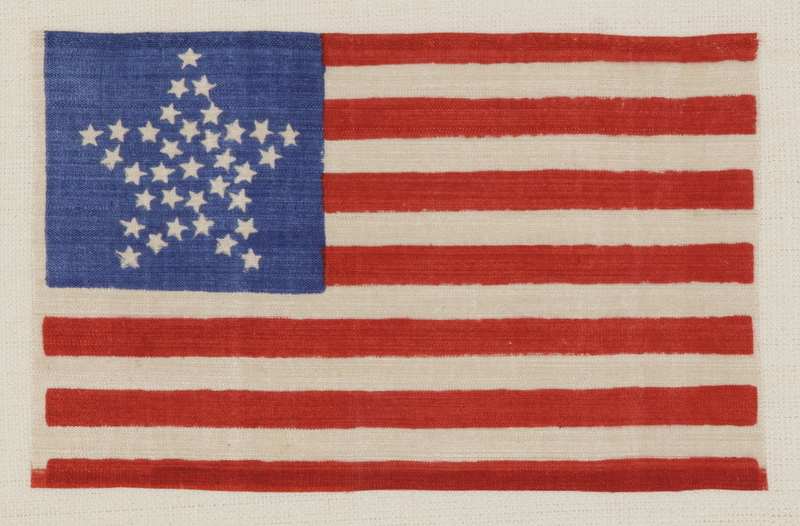 The star count remained official until July 4th, 1863, and 34 star flags would have generally been produced until the addition of West Virginia in June of that year. 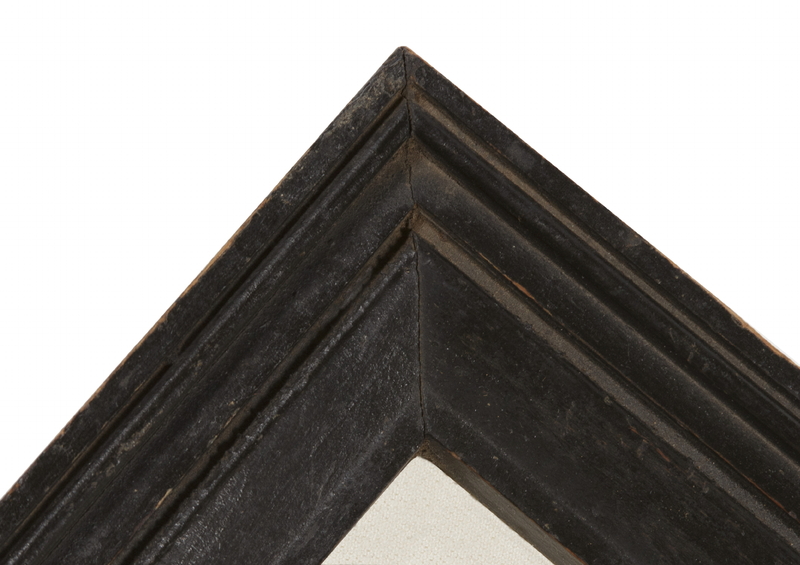 Mounting: The black-painted American molding is an exceptional one, dates between 1830 and 1850, and retains its original, early surface. 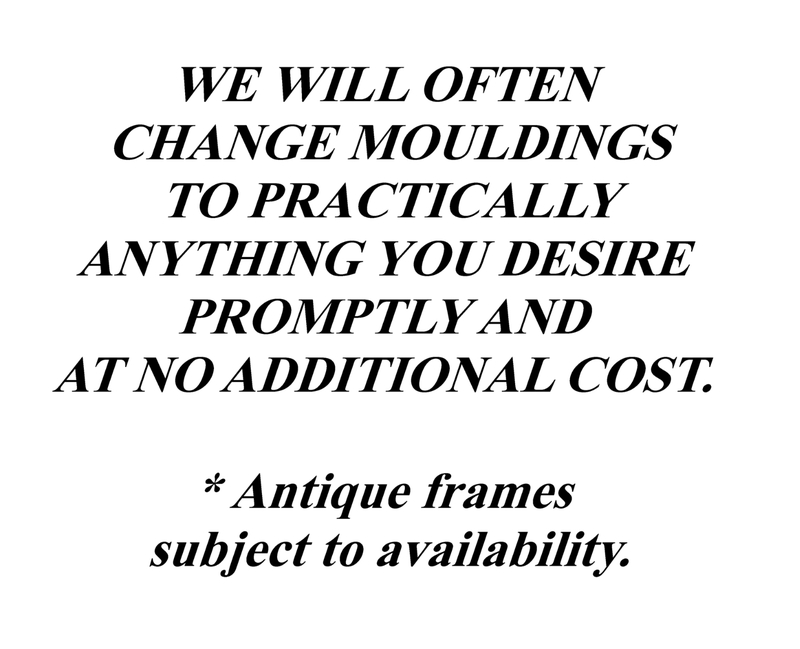 This is a pressure mount between U.V. protective acrylic and 100% hemp fabric.